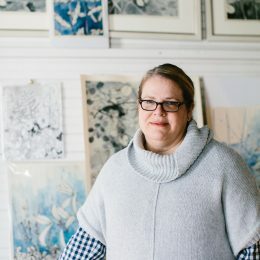 The gregarious and creative artist began painting wall murals as a student at Furman University, where she also received her degrees in English and Art. Her love for wall murals spilled over into her personal life when she began painting patterns all over one Mandarin Orange room in a little house by Cleveland Park twenty years ago. She immediately knew that this was what she was supposed to be doing. She continued painting murals, including the Stone Avenue Mural Project in the North Main area community. Jean mainly focuses on flowers in her work because she believes they are relentless. They keep going. They’re feminine yet strong. They’re constant. She believes that all things have importance and chooses to focus her art on things that aren’t as obviously important to the common eye. Finding and showcasing the important components of every day things is important to Jean as she brings her creations to life. One day a friend challenged her to stop doing things with florals and color and try working in black and white for a week, which is what gave birth to her current body of work. Different than her previous projects, but still focusing mainly on flowers and plants, these drawings and inks found life in the summer when she spent time in the mountains sketching plants, arrangements and growth. Her drawings still have her style, but with a whimsical touch. Through all of this, she still finds time to spend with her wonderful husband and kids.